Naftali Bennett responds to criticism by new Jewish Home chairman, wishes Jewish Home well in upcoming elections. Education Minister Naftali Bennett, the joint chairman of the New Right party, responded to the accusations made against him by new Jewish Home chairman Rabbi Rafi Peretz. "The people who were chosen [to lead the Jewish Home] are valuable, worthy, and good," Bennett said in an interview with Arutz Sheva. "I wish only success to the people of Tekuma and the Jewish home." Addressing Rabbi Peretz's criticisms of his abandonment of the Jewish Home, Bennet said that "we are brothers. I think it is important that the spirit of unity continue within religious Zionism and beyond." "Religious Zionism should understand that we are on a mission, such as sending a daughter for national service or a son to the army to go out and rise to the occasion. The New Right is striving for a national leadership and there is room for the 'New Right' party, which is very strong, alongside the Jewish Home, which will continue to operate. "Only next week we will launch the campaign, and I am convinced that we will reach a strong double-digit number, and that the Jewish Home and Tekuma, if they form a large union on the religious right, will pass the threshold," Bennett added. He said that the religious right needed to unite to deal with pressure on the diplomatic front. "Right after the elections, Trump's 'Deal of the Century' will be unveiled. It is a plan that will talk about a Palestinian State in 90% of the territory. It will be difficult because Trump helped Israel and now he expects us to go with him to the end. We know about this fact, but not the specific details of the plan." "This is a plan that will include a Palestinian state, not to evacuate settlements, but to leave the settlements in areas under Palestinian control, while encouraging them to evacuate. This is a real threat and we must not bask in the past two years. The situation can change and only with a large front that goes far beyond the religious can we stop it. It cannot be that, like it was during the disengagement, that there will be the only religious people standing against it, because then we will be run over. 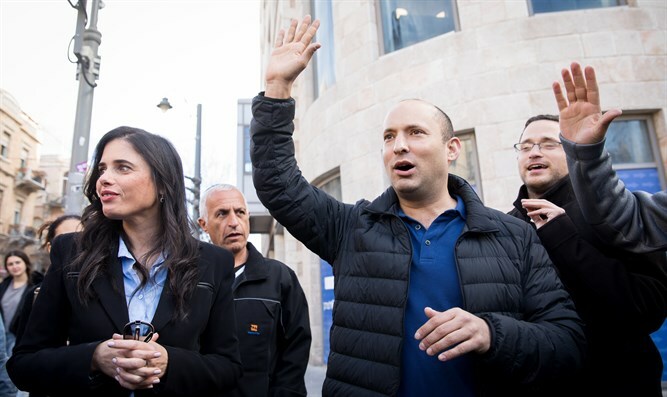 When asked if it was perhaps wrong for him to have split form the Jewish Home and left several right-wing parties facing the possibility of not passing the electoral threshold, Bennett replied that the opposite is the case. "On the eve of the right-wing explosion and the establishment of the 'New Right', the right-wing bloc stood at 57 seats and then moved up to 63 seats and it has stayed stable. The voters of Eli Yishai and Otzma Yehudit would not vote for me if we stayed in the Jewish Home and traditionalists in the periphery would not vote for the Jewish Home. We are saving 5 Knesset seats. "Those who have to make unions will do so. We are now standing at 7-8 seats and we will finish around 11-13 in the polls and perhaps more, but it is important that Otzma Yehudit, Eli Yishai, National Union and the Jewish Home look around and understand that you can sign-on to run in a technical bloc. I trust the leaders' sense of responsibility in all these places and appreciate them. Bennett said that "our whole strategy is to bring votes outside of religious Zionism. I said it and we stand by it. Those who come with us from religious Zionism are blessed and desirable, and already four Knesset seats have come in that are connected to our line and that's good, but our campaign is turning outward." "We will continue to take care of all the missions of religious Zionism and of Zionism in general, to all the religious Zionist establishments that serve the Jewish people," he added. "I am very optimistic. The important thing is to understand that the next prime minister is Netanyahu, who is far more powerful than the 'fake right' like Ganz and Lapid," Bennett said, recalling how Netanyahu once brought in Ehud Barak to be his defense minister despite Barak's left-wing credentials. "He invited Barak and they went for the freeze, the release of terrorists and a Palestinian state, and in 2013 Netanyahu's first partner was Tzipi Livni, who received the justice portfolio, and in 2015 he tried to bring in Livni and Bojie [Herzog]." "In the end, this is a tug-of-war contest, who will be Netanyahu's main partner in the next government," says the minister, explaining that his party's goal is to take the reins of the national leadership into their hands. "We are marking as our goal the era after Netanyahu, when he decides that should be. We will strive for the national leadership of all of Israel and we should not fear it. A person wearing a skullcap can be defense minister and prime minister of Israel. Religious Zionism must leave behind its inferiority complex, and even a kippa-wearing person with a strong Jewish identity can be prime minister." "Everyone will see in the coming months, certainly after the Trump plan has come to light, how vital it is to be a right-wing party that is not only religious, so that we do not have another disaster like the disengagement again. I am convinced that if someone had established such a party in 2002, the disengagement would not have taken place," Bennett concluded.